Another interesting chapter today, to continue with our study guide to pass the Professional vSphere 6.7 Exam 2019. Today's chapter: VCP6.7-DCV Objective 1.4 – Differentiate between NIOC and SIOC. Storage I/O Control (SIOC) allows throttling VMs accessing a datastore which has exceeded a certain latency. Network I/O Control, on the other hand, allows you to reserve network traffic. But we'll go into further details how those two technologies works, later in this post. With SIOC enabled on a datastore, you prevent the other VMs from the “noisy neighbor” situation where a single VM takes all the resources. The device’s latency is monitored. If latency is higher than configured values, SIOC kicks in and reduces the latency by throttling back VMs that are exceeding their consumption of IOPS. Storage IO Control (SIOC) only kicks in when there is a contention. SIOC makes sure that every VM gets its fair share of storage resources. 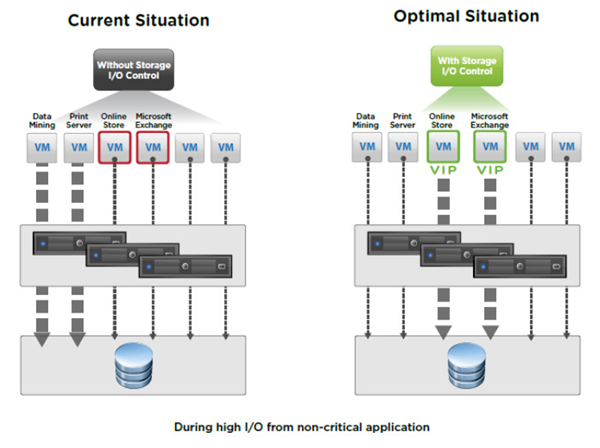 Storage I/O control can “heal” part of your storage performance problems by setting a priority at the VM level (VMDK). You know the “noisy neighbor story”. When you enable Storage I/O Control on a datastore, ESXi host starts to monitor the device latency that hosts observe when communicating with that datastore. When device latency exceeds a threshold, the datastore is considered to be congested and each VM that accesses that datastore is allocated I/O resources in proportion to their shares. By default, all VMs are set to Normal (1000). You set shares per VMDK. You can adjust the number for each based on need. The default is 1000. Storage I/O Control operates as a “datastore-wide disk scheduler.” Once Storage I/O Control has been enabled for a specific datastore, it will monitor that datastore, summing up the disk shares for each of the VMDK files on it. Storage I/O Control will then calculate the I/O slot entitlement per ESXi host based on the percentage of shares virtual machines running on that host have relative to the total shares for all hosts accessing that datastore. NFS v4.1 isn’t supported (it is for NFS v3). Storage I/O Control does not support datastores with multiple extents. SAN with auto-tiering has to be certified for SIOC. Must be disabled before removing a datastore. Raw Device Mapping (RDM) is not supported. (it is on iSCSI NFS and FC). When you enable Storage I/O Control (SIOC) on a datastore, the host starts to monitor the latency. When latency on the datastore with enabled SIOC is more than the configured threshold, vSphere views the data store as “congested” and each VM that is accessing the SIOC enabled datastore is allocated I/O resources in proportion to their shares (that we'll configure on a per VMDK level). The I/O filter framework (VAIO) allows VMware and its partners to develop filters that intercept I/O for each VMDK and provides the desired functionality at the VMDK granularity. VAIO works along Storage Policy-Based Management (SPBM) which allows you to set the filter preferences through a storage policy that is attached to VMDKs. Step 1. Activate SIOC at the datastore level via vSphere Client or vSphere Web client. Select Datastore > Configure > General > Storage I/O control section. Step 2: Set the number of storage I/O shares and an upper limit of I/O operations per second (IOPS) allowed for each virtual machine. By default, all virtual machine shares are set to Normal (1000) with unlimited IOPS. VM Storage Policies – takes control of which storage is provided to the virtual machine, how the VM is placed within the storage, which data services are offered for the VM. 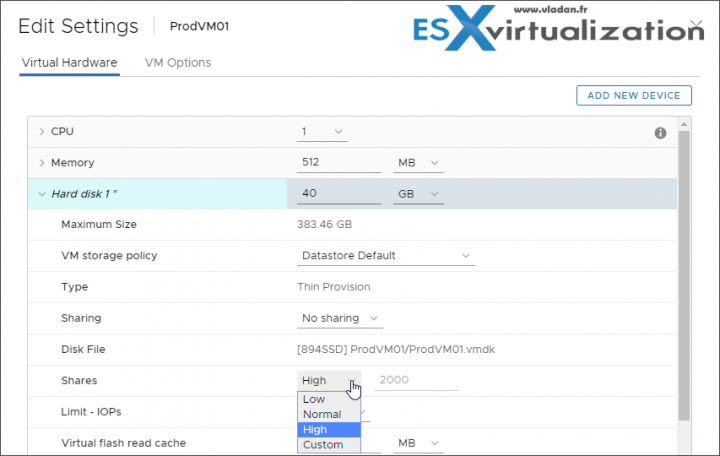 Create a VM storage policy. Home > Policies and profiles > VM storage policies. 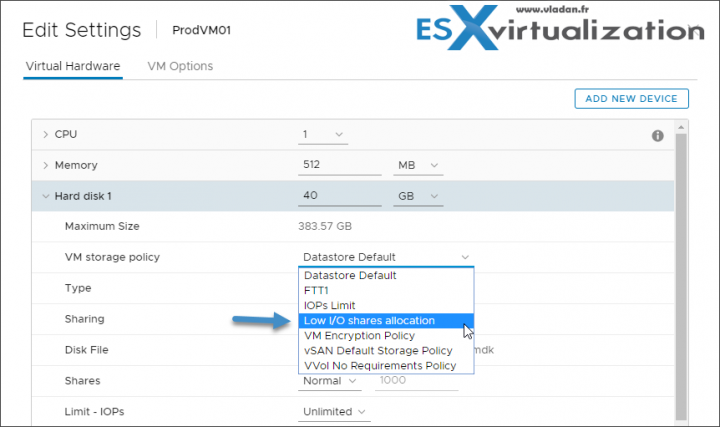 Once done, you can assign this VM storage policy to a virtual machine. Storage I/O Control is supported on Fibre Channel-connected, iSCSI-connected, and NFS-connected storage. Raw Device Mapping (RDM) is not supported. Storage I/O Control does not support datastores with multiple extents . Enable network resource management on a vSphere Distributed Switch to guarantee a minimum bandwidth to system traffic for vSphere features and to virtual machine traffic. control at the VM network adapter level similar to the model that you use for allocating CPU and memory resources. In the vSphere Web Client, Home > Networking > navigate to the distributed switch > Configure > Properties > Edit > General > Network I/O control > Enable. For system traffic – You can configure Network I/O Control to allocate a certain amount of bandwidth for traffic generated by vSphere Fault Tolerance, vSphere vMotion, etc. Home > Networking > DVSwitch > Configure > Resource allocation > System traffic. For VMs – Version 3 of Network I/O Control lets you configure bandwidth requirements for individual virtual machines. You can also use network resource pools where you can assign a bandwidth quota from the aggregated reservation for the virtual machine traffic and then allocate bandwidth from the pool to individual virtual machines. A network resource pool provides a reservation quota to virtual machines. The quota represents a portion of the bandwidth that is reserved for virtual machine system traffic on the physical adapters connected to the distributed switch. You can set aside bandwidth from the quota for the virtual machines that are associated with the pool. The reservation from the network adapters of powered on VMs that are associated with the pool must not exceed the quota of the pool. Network I/O Control allocates bandwidth to traffic from basic vSphere system features. Shares – Shares, from 1 to 100, reflect the relative priority of a system traffic type against the other system traffic types that are active on the same physical adapter. The amount of bandwidth available to a system traffic type is determined by its relative shares and by the amount of data that the other system features are transmitting. For example, you assign 100 shares to vSphere FT traffic and iSCSI traffic while each of the other network resource pools has 50 shares. A physical adapter is configured to send traffic for vSphere Fault Tolerance, iSCSI and management. At a certain moment, vSphere Fault Tolerance and iSCSI are the active traffic types on the physical adapter and they use up its capacity. Each traffic receives 50% of the available bandwidth. At another moment, all three traffic types saturate the adapter. In this case, vSphere FT traffic and iSCSI traffic obtain 40% of the adapter capacity, and vMotion 20%. Reservation – The minimum bandwidth, in Mbps, that must be guaranteed on a single physical adapter. The total bandwidth reserved among all system traffic types cannot exceed 75 percent of the bandwidth that the physical network adapter with the lowest capacity can provide. Reserved bandwidth that is unused becomes available to other types of system traffic. However, Network I/O Control does not redistribute the capacity that system traffic does not use to virtual machine placement. For example, you configure a reservation of 2 Gbps for iSCSI. It is possible that the distributed switch never imposes this reservation on a physical adapter because iSCSI uses a single path. Limit – The maximum bandwidth, in Mbps or Gbps, that a system traffic type can consume on a single physical adapter.